* Because every mention of rings must, for the rest of eternity as we know it, reference Beyonce. This past Sunday, Nathan and I visited some local jewelry stores, to see what was out there as far as wedding rings go. We'd talked about rings on and off, and over time I found myself visualizing something very different than I had expected. Namely: bling. Here's the thing: I did not want, and thus did not receive, an engagement ring. I'm not a huge jewelry person, and I'm usually adorned with nothing more than cheap, dangly earrings. 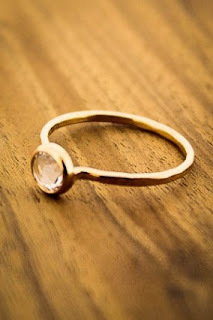 Engagement rings have an uncomfortable connotation for me - the idea that a man marks his territory with a sparkly diamond - plus, after nine years and two dogs, Nathan didn't have to get me a ring to prove that he was serious about marriage. And finally, we're broke. Engagement rings, like everything else wedding related, are expensive. I figured one ring - a wedding ring - would be more than enough. I don't regret this decision. And yet, when we walked into the first jewelry store, the woman behind the counter somehow coaxed me into trying on a few sparkly diamond rings. As soon as that first diamond slipped on to my finger, I knew we were in trouble. 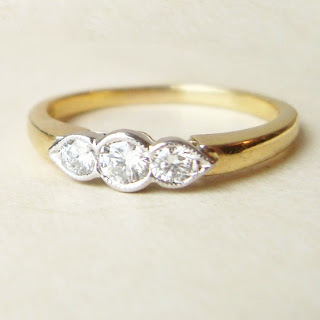 Vintage diamond ring from Etsy. As much as I am not a big jewelry person, as much as I don't need a diamond, I realized that I liked the sparkle. That I want something different from what I would usually default to - that a simple silver or gold band would disappoint me. I'm not talking anything huge or obscene. 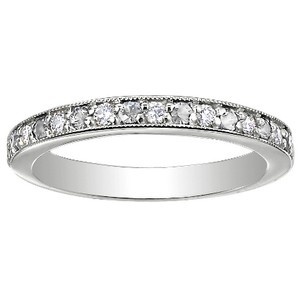 In fact, the ring I liked the best was the smallest - 1/4 carat band, channel set, with a row of the tiniest diamonds. It was simple and elegant and beautiful and most of all affordable, and oh, how I wanted it. But nothing is as easy as it seems, especially not when it comes to wedding planning. As I admired the pretty ring on my finger, I asked the woman a few questions about the diamonds. Where did they come from? Were they conflict free? What kind of guarantees did this ring come with? Because while I was entranced by the sparkle and glitter, I'm still a dirty hippie deep down. I didn't want an indulgence on my part to mean death and torture for somebody else. The woman then told me about the Kimberley Process, which was established in 2003, and monitors all the diamonds that enter the market. "Every ring you see in a store today," she assured us, "is conflict free." This sounded great - a little too great. So as soon as I took the ring off my finger, I went home and got to Googlin'. I quickly discovered that while the Kimberley Process aims to regulate the diamond trade, it's far from a perfect organization. It follows a very narrow definition of "conflict free," so while the diamonds may not have funded a civil war, they could still have contributed to other forms of violence and cruelty. The Kimberley Process also doesn't require diamonds to be traced back to their mine of origin, doesn't audit diamond buyers and sellers, and does little to monitor smuggling of diamonds into the market. Basically, while the Kimberely Process is a step in the right direction, it is certainly no way to guarantee that "every ring you see in a store today is conflict free." So what does a someone who wants a beautiful and sparkly piece of jewelry to commemorate a lifetime of love and commitment do? A few things. I said goodbye to all the rings in the stores, and turned my attention to websites that specialize in conflict-free, sustainably harvested diamonds. The best one I've found so far is Brilliant Earth, which has an easy-to-navigate website, a range of styles and gems, and a sound mission that aligns with my morals. The last band pictured above is very close to the ring I fell in love with at the store, but it's a bit more expensive. Another option is to go the vintage route. I am more inclined to buy a diamond of questionable origin if the diamond in question is second-hand. That way, I wouldn't be directly supporting any sort of violence or treachery. Etsy is a great place to look for vintage jewelry, and I plan to visit a few antique stores in town next time I have a chance. Of course, there's the issue of the diamond, period - why bother, when diamonds have such a dark and terrible history? When one of the main reasons we're taught to desire diamonds is because of clever marketing from ring manufacturers? When a diamond ring is unnecessary, indulgent, and fiscally irresponsible? Why, indeed? I can't really answer that question, because I'm still trying to figure it out myself. I will say that I don't need a diamond - I'd be happy with any kind of gem that sparkles and feels right on my finger. I do want something that will stand the test of time, that will remain lovely and elegant until my old age. I want something simple and understated, so that I will not get sick of it in ten or twenty years. I want something that represents the love Nathan and I share. Diamonds feel like the obvious choice, for a hundred fucked up reasons, but that doesn't mean the ring I choose will have one. It just means it's something I'm considering, and considering a diamond means considering a lot more than just a sparkly ring on my finger. * Note: none of the rings pictured in this post are ones I tried on. They're just rings I like - click the images for Pinterest links. ** Also, Nathan is looking for a ring as well, but he didn't want to try any on - he still has no idea what he wants and didn't want to feel pressured by salespeople.